Such a cute video!! My dog will do ANYTHING for the TJ dog biscuits. Seriously, it's a little bit scary. Thanks, Hillary! We haven't gotten the actual biscuits yet...but Alfie and Sadie are hoping to try them soon. Oh no! That's sad. Our dogs seemed ok after they ate them, but maybe you're right: just a bad batch. All three off my little dogs got very very sick after eating these treats! Vomiting & Diarrea all the next day. Today is the second day & two have started to eats again thanks god! I love TJ's but have bought this & dogs food from them & they have been sick both times. Sorry TJ's I give these a HUGE thumbs DOWN! Yes they were all happy to eat them but not happy for the next 24 hours. Your dogs are ADORABLE. Are they powderpuff cresteds? I'm not great at identifying small breeds. I'd love for my three to try these, but my American Bulldog mix has a really sensitive stomach, and as he's a service dog, that's a doubly bad thing. My other two would likely inhale these. Thanks. We're pretty sure they're half chihuahua and half terrier (Cairn?). We adopted them, so nobody's really sure. That's awesome you have an American Bulldog that's a service animal! 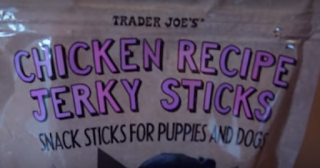 Do not give these to your dog if he has stomach issues! They made all three of my dogs very sick. I would not want anyone to go through what I just did over the last 24 hours. I know for a fact these treats caused the issues they all had because, I feed my dog all natural everything. I cook all there meals & now will be making all there treats at home as well.. I own a Mini Winnie , A Toy Pom & A Chi. They all have been in great health until the night I thought I would try these treats! 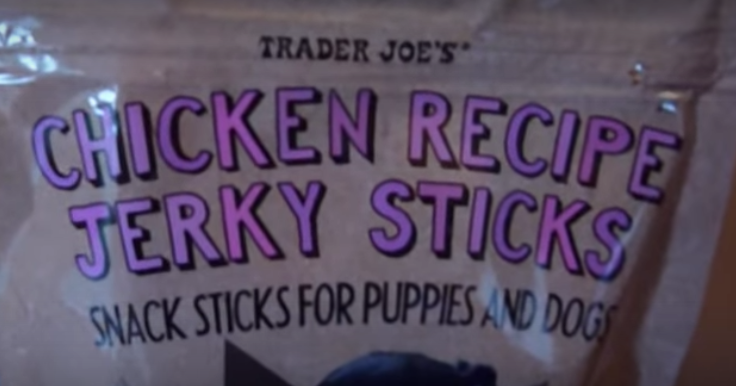 We have a 5 lb Malti poo and have been giving her the chicken jerky strips from TJs. She has been so sick the past two days. Throwing up and pooping all over. Ill never buy from TJs again. Maltipoos have sensitive systems. I give these to my maltipoo in small amounts and he loves them. This breed has trouble processing fat, and the rest of his diet is very low fat. I think the treats may be too big for smaller breeds I would not give a dog that size a whole stick. I have three chihuahuas under ten pounds and i split one treat 3 ways and they get two pieces a day. I think more than that maybe causing the tummy problems with other dogs. My three have never had an issue with the TJ treats and we have been eating them for years. I think I've identified these as the cause for our dog's diarrhea. He isn't able to digest and I've found literal chunks of this in his poop. Love TJs but will never feed my dog their products again.